Music is imprinted into Persian culture, pre-dating Islam by more than 1400 years. By the time of Islam’s arrival in Iran in the seventh century, Persians had already developed the theoretical framework for the Middle Eastern music, which is valid to this day. The twelfth century marks a point of departure, as Sufism penetrated Persian culture and poetry became intertwined with music. 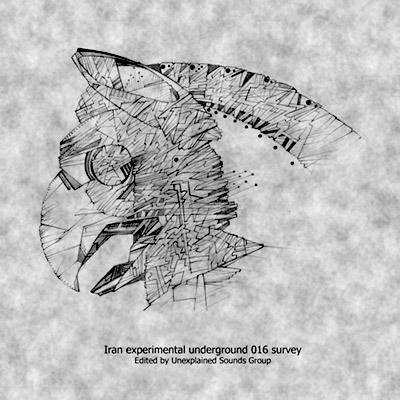 By surveying avant-garde music in Iran, Unexplained Sounds made their first incursion outside the “western culture” into a highly fertile ground. Not surprisingly, this journey has been handsomely rewarded. The sample consists of 19 high-quality tracks, where we found a wide range of unique voices and compositional styles resulting in a mature body of work. Upon listening to these remarkable artists, you will be wondering whether there can a better place for the development of experimental music outside the west. Unexplained Sounds, together with Iranian experimental musician Morego (aka Xerxes the Dark, Nyctalllz, Ostanes, Nahan, and Blind Owl), decided on making a compilation album, focusing on Iranian experimental electronic music. So, on June they made an open-call, and released the album on early July 2016.